My favorite place to be in the morning! We are moved! Thank you for being patient while we got through this last week of the move. Everything has finally been moved over from the old house and found its place in our new home. The WiFi has been reconnected, pictures hung and everything put away. We’re still having to stop now and again and figure out where something it, but for the most part the whole move went very smoothly. Only one thing broke: a cheap glass pitcher that we maybe used once every other year or so, if that. There was definitely no heartbreak over losing it. Although things are a bit smaller space-wise here than it was at the old place, all of our things fit in comfortably. It really is so much nicer here. For starts, it’s cleaner and quieter. There are still chickens & roosters around, but nowhere near as many or as noisy, and we no longer have to deal with downstairs neighbors. Best of all, we have a lanai and can finally enjoy being outdoors more. We didn’t realize until we moved into this house how trapped we had been in our old place. We had beautiful views from each window, but were unable to be outside unless it was to go down the stairs and get in the car and go somewhere else (we couldn’t even enjoy sitting out on the lawn because of the mosquitos and the downstairs neighbors who seemed to claim all the outside as theirs). 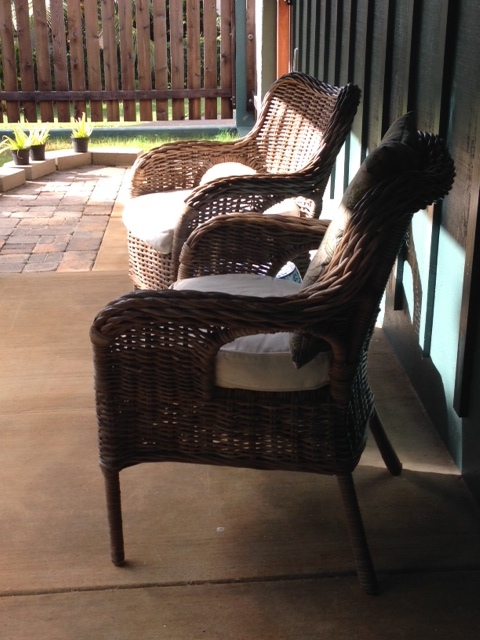 I have been enjoying my coffee outside every morning, something I dreamed of doing when we moved to Hawai’i. Reading: I finished A Pleasure and A Calling this past week (lots of time to read with no Internet) and started The Boys In the Boat, by Daniel James Brown, about the men’s rowing team that won the gold medal at the 1936 Olympics in Berlin. I know nothing about rowing, so it’s interesting learning about the sport. Listening to: It’s very quiet over here today. We can hear roosters off in the distance, but there are none screeching up close and personal like we had at the other house. Everyone here is either reading or working on something so it’s quiet inside too. Watching: Brett and I are back to watching Midsomer Murders and Murdoch Mysteries. We’re hoping we can finish both series by the end of this year and move on to something else! The hardware was already in place in this house to wall-mount our TV – it not only saves space but looks great! Cooking/baking: Tonight I’m fixing Italian sausage and zucchini in tomato sauce to serve over pasta. I bought a lemon meringue pie yesterday and more than half is left, so no need to bake anything. Happy you accomplished this past week: Getting this move over with and everything put away! We also got the old place cleaned out and ready for the next tenants, as well as selling them a bed we don’t need any more. I also have everything purchased for our Thanksgiving meal – no more trips to the store until next weekend, when Brett and I will do our big shop-athon. And, I arranged for a photo shoot for when my son and family are here next month. I am excited to work with this particular photographer, and she is super-excited about working with our family as well. Looking forward to next week: We’re meeting with the old landlord on Tuesday to hand over the keys and get our deposit back. And of course I’m looking forward to . . . Thanksgiving! It’s my favorite holiday of the year, both for time with the family and for the food. Grateful for: Being able to sit outside and enjoy the sunshine while I sip my morning coffee. Being connected to the Internet again. Finding this house and being able to afford to move. Knowing that everyone in our family is healthy and happy no matter where they are in the world. Bonus question: What do you serve for Thanksgiving? We’re pretty traditional here with our Thanksgiving menu: I’m fixing roast turkey, mashed potatoes and gravy, dressing, cranberry sauce, steamed baby peas, and biscuits. The girls have let me know though that they don’t really care all that much for pumpkin pie, so this year we’re having pumpkin cheesecake instead. I used to always roast a whole turkey, but they’re fairly expensive here so these days I buy a roasted turkey breast from Costco. They’re more affordable, less mess, and they’re delicious. Plus, we get at least four meals from one breast so still can enjoy Thanksgiving leftovers. How is your Sunday going? What are you up to this afternoon? Turkey or turkey breast, mashed potatoes, cornbread dressing, giblet gravy, green beans, sweet potato, the same jello salad Mama made since I was about eight, rolls. If I am not too tired, I may make pumpkin pies. It is just me here, so no one will miss the pie. The sweet potatoes are baked, removed from their skins and mashed up in a bowl with NO sugar or butter. I use a variety that is naturally sweet. Sounds delicious! I’m making cornbread dressing too (my favorite), and would love to serve sweet potatoes and jello salad but our girls like neither – maybe when they have moved out I will make those things again for my husband and I to enjoy. I like my sweet potato mashed with some butter and a tiny bit of cinnamon. My mom always made giblet gravy; it was OK but I can take it or leave it. So glad the move worked out so well. How nice that you have a lanai, and also that you won’t have missing laundry supplies. Well worth moving, just for those 2 things. I used to row in high school and college. Please let us know if the book is a good read! We were very happy to leave our former downstairs neighbors behind. They were difficult people. I did not realize there was so much strategy involved with rowing! Your lanai looks so nice & inviting! We have had cold, snow and horrible driving conditions this weekend – BOO!!! We are looking for a chaise longue to put out there, but haven’t found anything yet. We also plant to dress it up with some plants, but are not in any big hurry. I love it out here though! So happy to hear that your move went smoothly and that you’re all settled in! I love your lanai also! That’s the one thing I’m looking forward to the most! We are very traditional as well. My mom has been making Thanksgiving dinner every year since I was born and although she complains a little, she won’t let anyone else make it!! We are switching it up a bit by having Kings Hawaiian stuffing instead of my mom’s homemade, and we’re bringing a chocolate pie instead of pumpkin. I think this was the easiest move we’ve ever done. It was so nice being able to bring a few things over every day and then get them put away as they arrived. Our biggest move day was last Saturday: four carloads of stuff and Brett brought three van-loads over. He did an amazing job of getting lots of stuff down the stairs at our old place and loaded into the van. Pretty impressive for a 65 year old! I think I need that Kings Hawaiian stuffing recipe! I used to always make apple and pecan pies as well as pumpking, but this year I’m skipping the apple and making pecan pie bars for when Meiling arrives home (less than three weeks! ).